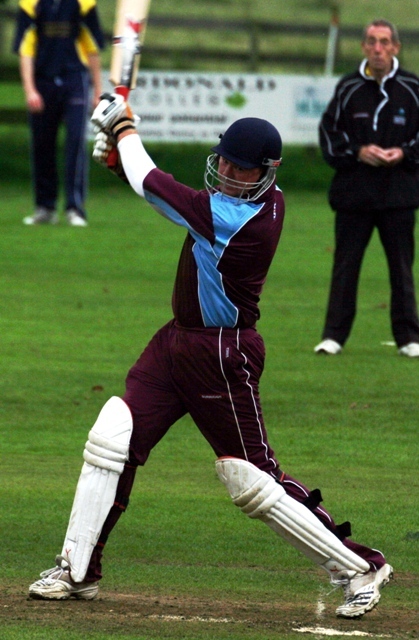 APD Dumfries faced two last over finishes last weekend. One they lost, one they won. In the National Division 2 match at Freuchie the home side needed 6 off the last over and got it with the first ball. They were chasing a revised target of 170 in 37 overs after a couple of interruptions and thanks to opener R Birrell scoring 95 not out reached that with few mishaps losing four wickets. Dumfries scored 211 for 8 in 50 overs in the first innings with Josh Geary scoring 64 and Chris Bellwood 46 but in hindsight the verdict was not enough runs. Dumfries bowled well conceding no runs to wides or no balls. Extras totalled just 2. The loss means the side slipped from second to third in the table and out of the promotion play-off spot. In the Borders Final of the Murgitroyd Twenty20 competition at Gala on Sunday APD Dumfries succeeded in the last over hitting 12 runs to win by 8 wickets chasing the home total of 124 for 6 in 20 overs. Davie Davidson hit 39 not out and, following his four wickets, skipper Beveridge hit consecutive fours to win with just one ball left for his 25 not out. The side play in the Scottish semi-finals in Glasgow a week on Sunday. In Western Union Division 2, JMS Nunholm lost a close match at home by 3 wickets. An innings of 84 not out by Clarke won the match for GU Staff after Nunholm posted 186 all out with Chris McCutcheon again the mainstay of the innings with 71. On Sunday Marcus Richardson starred with the bat scoring 78 as a young Dumfries XI totalled 169 for 7 against a Greenock XI in the Strathclyde Sunday League. Despite a late innings flourish Dumfries won by 46 runs with Niall Alexander and Peter Johnstone each taking three wickets.